Finding ways for companies to interact and stay engaged with their clients is very important. Being memorable is one of our 3 Keys To A Successful Trade Show. It keeps your business top of mind with your current and potential customers and helps to increase brand awareness about your company. Using 3 dimensional signs to create engagement with the public may not something you have thought of, but you can see by the examples below, interactive displays can get your info shared to a larger audience. While many of our clients already come to us for unique signs for their trade shows and customer appreciation events, some really want to ensure that the audience takes the time to visit their display. This is when a PLINKO game can make an impact. 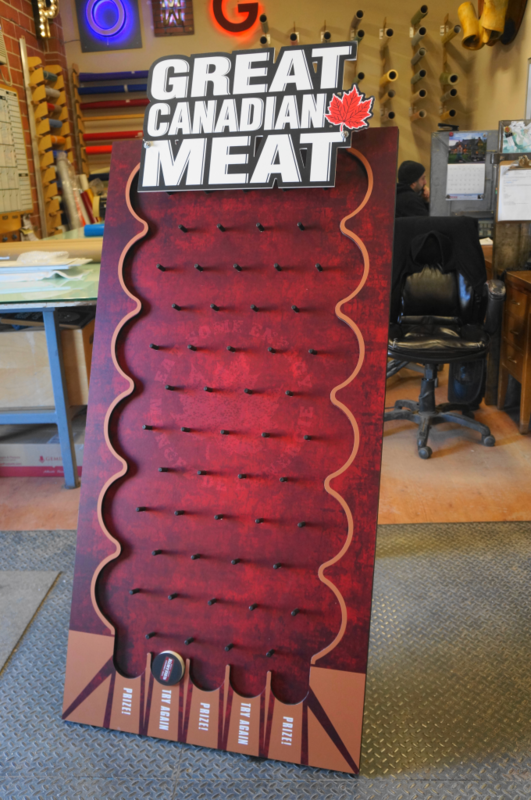 While Heffner Toyota uses their custom Plinko game for customer promotions, The Great Canadian Meat Company is taking theirs to upcoming trade shows and the Portland Trail Blazers use theirs to interact with fans. Each of these circumstances create memorable experiences between the brand and their audience. When it comes to creating buzz about your brand, social media is one of the best ways to spread your message. Most people think of interactive displays as immersive virtual reality or augmented reality experiences, but any display that people interact with counts as well. Souvenir City came to Sign Depot to create a 3 dimensional sign structure to use as a photo booth prop for their Niagara Falls location. As you can see by tweet below, their visitors are putting it to good use by snapping photos and posting it on social media channels. Whether you are looking for leads at a trade show or search for new fans online, using your business signs to display your brand is a great way to gain exposure. The sign-making experts here at The Sign Depot are here to assist you with your branded signage. Just visit the CONTACT US page to request a free quote.